Today is Election Day. During the four years under Barack Obama’s presidency, we’ve had the privilege of becoming familiar with the great woman behind the great man: our First Lady. 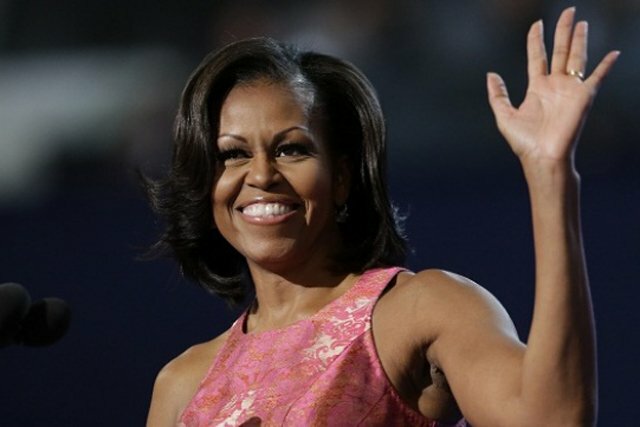 Michelle Obama isn’t your average First Lady – hence the best shaped arms we’ve ever seen and her candle-lit smile. While fully engaging in her role as the President’s wife, Michelle has made it a point to utilize beauty, brains and a bona fide sense of style. The term, “superwoman,” is definitely an understatement. While waiting for the final decision to be made, take a look at some of Michelle’s best paparazzi moments – let’s be honest, every moment is her best! 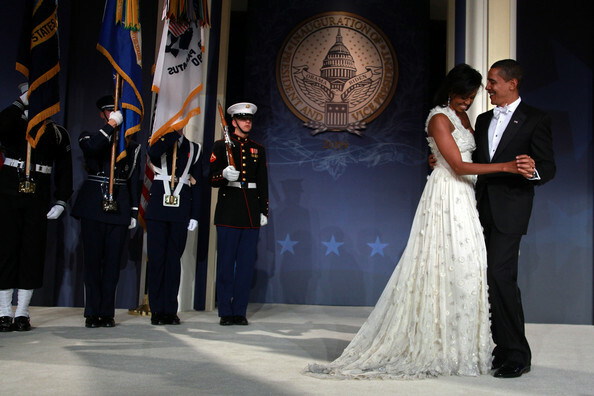 From the moment Barack was first elected into office in 2008, Michelle’s Jason Wu gown to the Inaugural Ball proved just how chic her style is. As the first African American couple in the White House, this moment was huge. Superstar, Beyonce – who Michelle later collaborated with in an effort to prevent childhood obesity – sang “At Last” for the couple’s first dance. 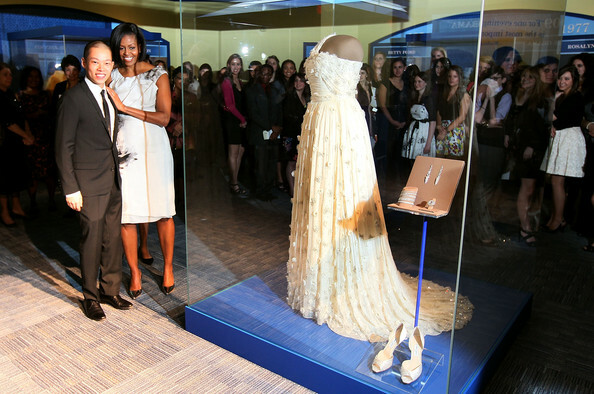 To continue the tradition, Michelle donated her gown, shoes and accessories to the Smithsonian Institute. A year later – in 2009 – Michelle reveals her most commonly-worn designer, J. Crew. With a style so modern and classy, J. Crew seemed to be made specifically for the First Lady. Michelle is a woman who values versatility. She often mixes high-end with low end designers. To the Governors Dinner in 2009, she wore a Peter Soronen dress with a bold, statement necklace by Tom Binns. 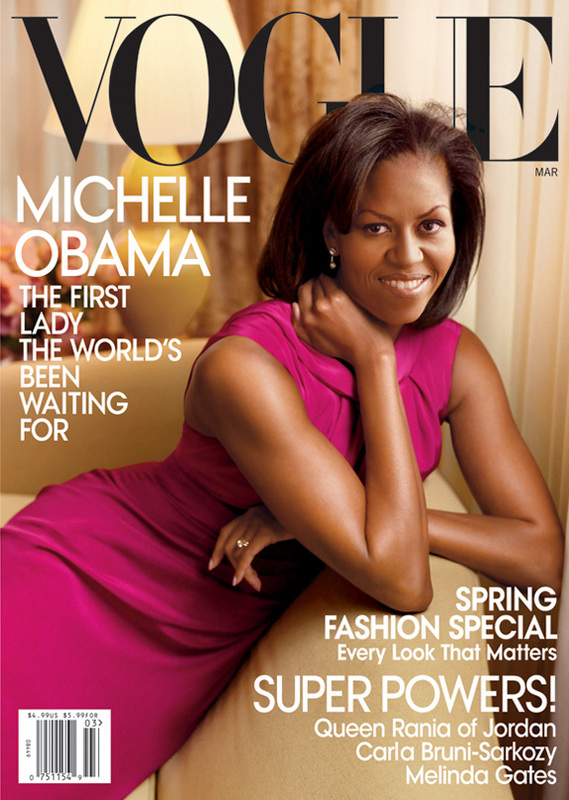 When have you ever seen a First Lady so fierce? 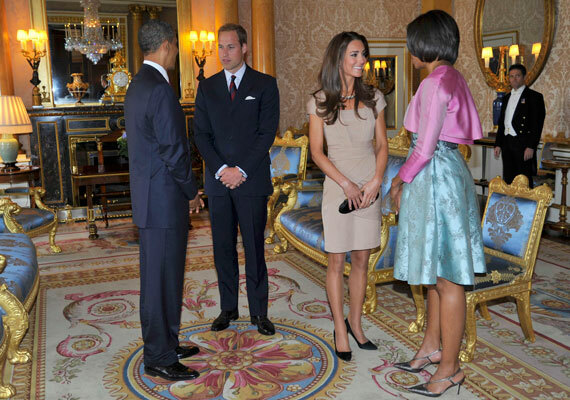 When the Obama’s met the Royal family in 2011, two generations of fashion icons combined. 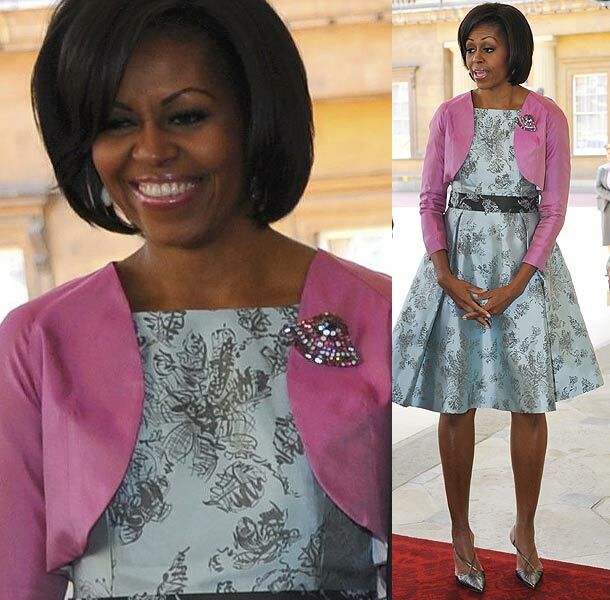 Michelle wore a metallic, floral dress by Barbara Tfank. She added a cropped, pink metallic jacket and silver point-toe heels. Ironically, spring 2013 collections such as Burberry presented a line full of metallic pieces. As we already knew, this is a woman who plans well for the future. In just a few hours, we’ll know who will lead our country for the next four years. As the first lady, Michelle Obama has helped support military families as well as working women who struggle with balancing both a career and a family. Not to mention, she is a wife and a mother of two beautiful girls. Through it all, she still manages to connect with Hollywood’s celebrity figures, including those in the realm of fashion. 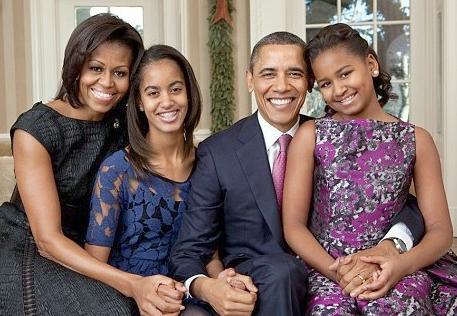 Michelle is nothing less than America’s Style Icon… and will continue to hold that title for four more years.